It was the 2019 ABCO EXPO, the largest independent HVAC and Refrigeration trade show in the Northeast. 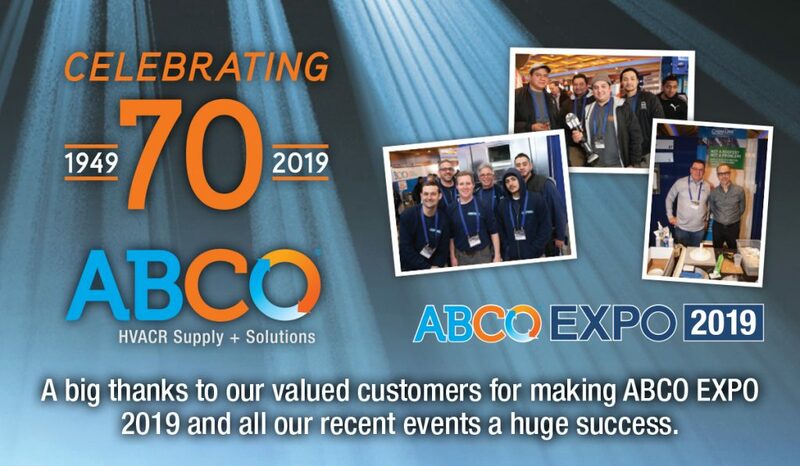 Held at Terrace on The Park in Flushing, NY, this year’s EXPO had added significance: it was a celebration of ABCO’s 70th year. Helping to mark the occasion, were more than 3,500 HVAC and Refrigeration manufacturers, contractors, builders, engineers, students and instructors, engaging with over 180 exhibits, product demonstrations — and each other. As Mitsubishi Electric’s Premier Distributor, ABCO introduced the advanced CITY MULTI® N-Generation VRF equipment that delivers higher efficiencies and heating capabilities in a smaller footprint. The new higher efficiency Hyper-Heat PUMY Series was also featured at the EXPO. American Standard Heating & Air Conditioning showcased the # 1 rated brand of equipment to contractors, builders, engineers, architects, students and instructors. Featured products included the Silver 16 and Platinum 19 Low Profile Series, designed to perform in the tightest of spaces, and new S8X1 | S8X2 single-stage furnaces that are rated with 2-stage outdoor systems. The ABCO/American Standard Residential Package Deals, an exclusive ABCO resource that makes it easy sell the best performing system for every home and budget, was also released at the show. ABCO University “Tech Talks”, featured at the show, covered a range of the industry’s most important new developments from Chemours, Heatcraft, Mitsubishi Electric, Emerson, ZONEFIRST and Russell/Kramer. Parker/Sporlan’s proved that seeing is believing with ZoomLock. Hordes of contractors and students got to experience the “Flame-Free Revolution” with a hands-on demo of the 10-second copper fitting connection, no brazing necessary. Luxaire, Mueller, Scotsman, Honeywell and other industry leaders were also on hand to meet attendees and present their new products. In addition, ABCO customers and partners showed how they to give back to the community with the Make-A-Wish raffle that raised thousands of dollars for children with life-threatening illnesses. The ABCO EXPO continues to establish and renew relationships and promote the exchange of important information and ideas in an exciting format. On behalf of ABCO’s Sales Account Managers and our entire ABCO Team, we’d like to thank our customers who attended ABCO EXPO 2019. Our deepest gratitude also goes out to all our customers for your business, friendship and support. We look forward to serving you each and every day as we strive to exceed your highest expectations.